The quickly-growing state-legalized marijuana industry creates a number of unique compliance and AML/BSA challenges for Financial Institutions (“FIs”).^ MRB Monitor, which helps financial institutions mitigate risk related to the industry, has identified 8,000+ Marijuana Related Businesses (“MRBs”). As such, it may be naïve to think that MRBs are excluded from the US financial system simply because banks are generally reluctant to work with the marijuana industry. This supposition is further supported by recent marijuana-related Suspicious Activity Report (“SAR”) activity disclosed by FinCEN to Dynamic Securities Analytics, Inc. pursuant to a Freedom of Information Act (FOIA) request. FinCEN reported 6,931 marijuana-related SARs were filed between February 14, 2014 and July 31, 2015. This number is more than twice the 3,157* marijuana-related SARs received between February 14, 2014 and January 26, 2015 per our April 13th post Who is Filing Suspicious Activity Reports on the Marijuana Industry? New Data May Surprise You. Depository Institutions (“DIs”) filing Marijuana SARs were located in 48 states plus DC and Puerto Rico (only HI and WY had no filers). This compares to “at least 42” states and DC in our April post. FinCEN received Limited SARs from filers in 32 different states; Priority SARs from 26 states; and Termination SARs from filers in 44 states. Perhaps more interesting, FinCEN provided detail that SAR “Subjects” (the individual or entity involved in the suspicious activity) were located in all 50 states, DC and Puerto Rico…and 34 unidentified foreign countries. Hawaii is the only “legalized” state without marijuana SARs. This is presumably due to the fact that Hawaii does not currently have an active legal marijuana market or any dispensaries. The fact that Limited SARs were filed in 32 states indicates that DIs outside of “legalized” states are working with marijuana related businesses, since only 23 states (plus DC, Puerto Rico and Guam) have “legalized” marijuana. If a Limited or Priority SAR was filed by a DI, FinCEN considers that DI to currently provide banking services to a MRB. In the opinion of these authors, this 266 number should be taken with a grain of salt since the number includes Priority SARs. 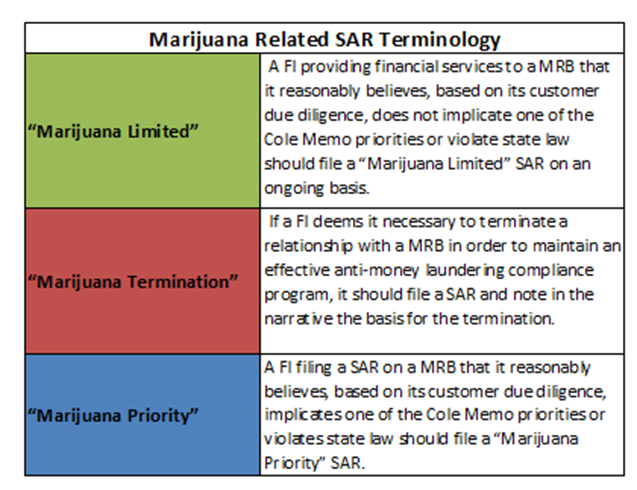 A Priority SAR means that a known MRB customer “implicates one of the Cole Memo priorities or violates state law.” In effect, this indicates that the MRB account is likely to be terminated. 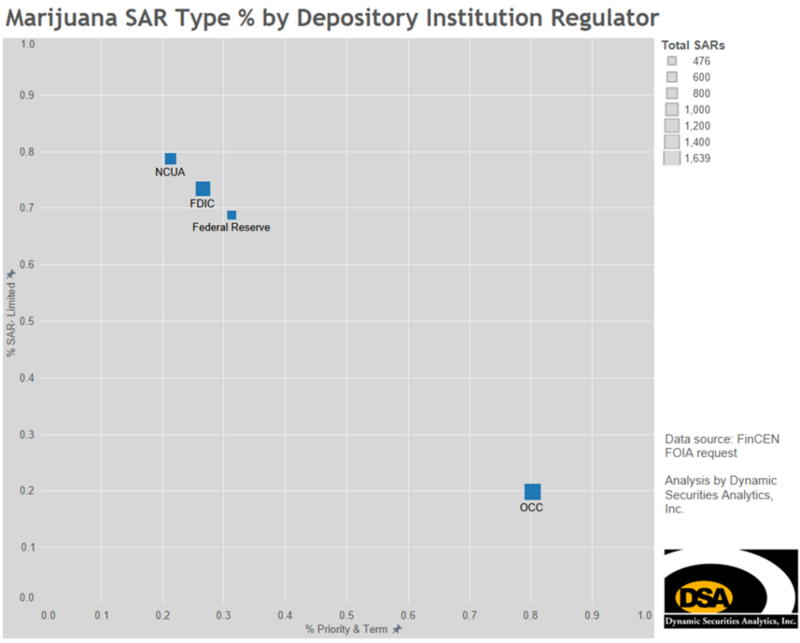 Based on marijuana SARs filings by type by primary regulator, credit unions – as represented by their NCUA regulator – have the most “open” arms to MRBs relative to other DIs. Only 9% of NCUA SARs were Termination while nearly 80% were Limited, indicating a relatively higher percentage of on-going relationships between MRBs and credit unions. On the opposite end of the spectrum, OCC-regulated DIs had the highest percentage of Termination SARs at a 74% and lowest percentage of Limited SARs at 20%. On a side note – as portrayed in our related post Securities Brokers have (Relatively) Open Arms to Marijuana Businesses– at 82%, SEC-regulated financial institutions are the only category to have a higher marijuana Limited SAR ratio than credit unions. ^ See: “Conflict and Uncertainty- Due Diligence Challenges for Marijuana Related Businesses” (originally published in the Sept/Nov Vol 14 No. 4 issue of ACAMS Today magazine) and “Practical Coping Strategies for Ever-Changing Marijuana Laws” presented at the Sept 2015 ACAMS conference in Las Vegas.